It’s been a busy and important few weeks in spaceflight. Some major milestones linked below. NASA announced nine recipients in the Commercial Lunar Payload Services program. Virgin Galactic completed a successful powered flight of SpaceShipTwo, reaching over 80 km altitude (note that some organizations define space at 80 km while others define it at 100 km). Among the launches listed below, the most significant is probably the Soyuz launch from Kazakhstan, which was a return to flight for the ISS program. Cosmonaut Oleg Kononenko and astronauts Anne McClain and David Saint-Jacques launched safely and docked to the ISS. Meanwhile, the crew from the failed launch in October has been reassigned to a future flight. November 29 – An Indian PSLV rocket launched carrying an Earth observing satellite. November 30 – A Russian Rokot rocket carrying communications satellites. December 3 – A Russian Soyuz rocket launched with three crew headed for the ISS. December 3 – A SpaceX Falcon 9 rocket launched from California delivered a plethora of payloads. December 4 – An ESA Ariane 5 rocket launched carrying satellites for India and South Korea. December 5 – A SpaceX Falcon 9 rocket launched carrying a resupply flight for the ISS. December 7 – A Chinese Long March 2D rocket launched carrying payloads for Saudi Arabia. December 7 – A Chinese Long March 3B rocket launched carrying the Chang’e 4 mission to the moon. December 16 – A Rocket Lab Electron rocket launched from New Zealand carrying a number of cubesats. The first stage booster for the Falcon 9 rocket launch on December 5th had to abort its return to launch site landing and ditch in the ocean. Meanwhile, the Dragon capsule successfully arrived at ISS. The two Russian cosmonauts currently aboard the ISS conducted a lengthy spacewalk last week to inspect their Soyuz capsule from the outside. 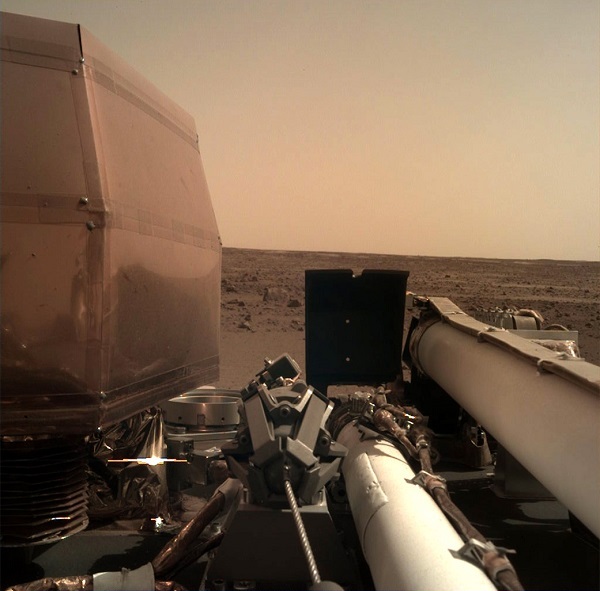 NASA’s latest Mars lander, Insight, successfully touched down on the Martian surface last month and has already begun operations. Below is a picture from the lander. NASA’s Osiris-Rex is now station keeping near asteroid Bennu. The probe has already discovered water-bearing minerals in the asteroid. Voyager 2 has passed through the heliopause and into interstellar space. NASA’s Marshall SpaceFlight Center has a new Director, Jody Singer. Members of the Jet Propulsion Lab’s media relations team have won an Emmy Award for coverage of the Cassini mission. Holly Ridings has been named the new chief of the Flight Director office at NASA’s Johnson Space Center. Veteran NASA astronaut Tim Kopra has left the agency. He flew to space twice, once serving as ISS commander. SpaceX has announced that Japanese billionaire Yusaku Maezawa has paid to be a passenger on a test flight around the moon. The following orbital launches have occurred since my last post. September 10 – SpaceX launched a Falcon 9 rocket from Florida carrying a Canadian communications satellite. September 15 – ULA launched a Delta II rocket from California carrying several research payloads. September 16 – India launched a PSLV rocket carrying two Earth-observation satellites. September 19 – China launched a Long March 3B rocket carrying two Beidou navigation satellites. September 22 – Japan launched an H-II rocket carrying an HTV cargo freighter bound for the ISS. September 25 – ESA launched an Ariane 5 rocket carrying two communications satelites. September 29 – China launched a Kuaizhou rocket carrying a small technology demonstration payload. October 8 – SpaceX launched a Falcon 9 rocket from California carrying an Argentinian Earth-observation satellite. The HTV-7 cargo vehicle was captured and berthed to the ISS several days after it launched. A Soyuz spacecraft carrying the returning ISS Expedition 56 crew has landed safely in Kazakhstan. Now that Drew Feustel, Ricky Arnold, and Oleg Artemyev are home, the next Soyuz is readying for launch. The Expedition 57 crew of Nick Hague and Aleksey Ovchinin are preparing to launch on Thursday, October 11, which will brin ghte ISS crew back up to 5 people. The Hubble Space Telescope (HST) has entered safe mode due to a failed gyroscope. Still no news from beleaguered Opportunity rover, on the surface of Mars. It has been 4 months. And now on the other side of Mars, the Curiosity rover is having issues of its own. JPL engineers are troubleshooting an interruption in science data from the larger rover. The Japan Aerospace Exploration Agency (JAXA) has successfully deployed 2 small rovers from the Hayabusa 2 spacecraft onto the surface of asteroid Ryugu. Astronomers have detected the first evidence of an exomoon (or moon around a planet around another star) using data from the Kepler and Hubble space telescopes. The planetary system is 8,000 lightyears distant. A bit of fun exoplanet news: astronomers have discovered a planet in orbit around 40 Eridani A, which is the star system of the fictional planet Vulcan from Star Trek. And lastly in the busy period of astronomy news, a new dwarf planet has been discovered beyond Pluto. Leonardo DiCaprio is going to produce a new TV series based on The Right Stuff. NASA’s new TDRS-M satellite had a mishap during pre-flight processing. Launch has been rescheduled while repairs are conducted. Virgin Galactic conducted another drop test of their SpaceShipTwo vehicle at the Mojave Air and Space Port. NASA’s fourteenth crew of the Human Exploration Research Analog (HERA) program started their 45-day mission yesterday. Rocket startup Vector Space Systems conducted a test launch of their suborbital rocket on Thursday. Here’s a short video of liftoff. The International Space Station crew is back up to 6 after a new Soyuz launched from Kazakhstan and docked just a few hours later. The three new ISS crew members, Sergey Ryazanskiy, Paolo Nespoli, and Randy Bresnik, are all spaceflight veterans. There are now 5 active Twitter users on ISS, sharing their thoughts, activities, and views with us! Check out their posts at this feed. In addition to the Soyuz launch, the only other rocket launch in the past two weeks was a European Space Agency Vega rocket. The rocket launched on August 2 from French Guiana carrying two earth observing satellites. In case you had forgotten that there are two active NASA rovers on the surface of Mars, here are some beautiful panoramas from Opportunity, on the edge of Endeavour crater. Results are in of the stellar occultation observation of object 2014 MU69, and astronomers think it may actually be a binary, rather that single piece of rock. 2014 MU69 is the Kuiper Belt Object (KBO) that the New Horizons spacecraft will visit in 2019. New evidence suggests there may be more water hidden beneath the surface of the moon than previously thought. Speaking of moons, a new paper analyzing the light curve data from Kepler of a distant star shows the possibility of a large planet with a large moon in orbit. Hubble is scheduled to do follow up observations in October to confirm the finding. It’s not often that a film gets made about your line of work. For most people, this might be a once-in-a-lifetime event. I am lucky: not only am I in a career but also an office building that attracts film productions on an annual basis. Some of the biggest movies of the past couple of years involve NASA astronauts or flight controllers: Gravity, Hidden Figures, The Martian. Nevertheless, it’s still rare for a film to focus directly on the mission operations team here on the ground. Don’t get me wrong, plenty of films get made that show the beauty and wonder of spaceflight. But in all of the IMAX movies (Space Station 3D, Hubble 3D, Journey to Mars, A Beautiful Planet) the flight controllers work quietly off-screen. Astronaut bio-pics are also a popular type of space movie, but of course in those films (In the Shadow of the Moon, The Last Man on the Moon) they are heavy on astronaut interviews and not much else. The last time a movie had NASA flight controllers as central characters was Ron Howard’s Apollo 13, over two decades ago. Finally, the drought is over. 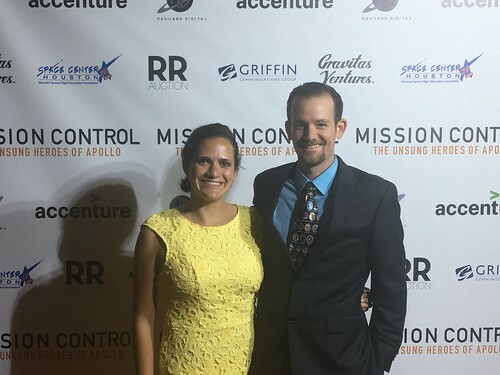 The new feature length documentary Mission Control: The Unsung Heroes of Apollo, has captured the soul of Houston’s Mission Control Center in a way not even Apollo 13 could. Mission Control is based loosely on the book Go, Flight! by Rick Houston. If you read my review of the book, you’ll know that I highly recommend it. Since the film consists entirely of interviews, it diverges from the book in many ways. The two major differences is that fewer people are profiled – only 17 men are interviewed – and the focus changes from the entire 30 year history of the MOCR down to the decade of work on Apollo. The focus gives the film life in that we get to really meet and hear from the flight controllers. In fact, the only audio we hear in the whole film is either the voices of the interviewees, or TV news coverage from the Apollo era. The editing removes all need for narration or a back-and-forth with an interviewer. While some of the interviewees are astronauts (Charlie Duke, Eugene Cernan, and Jim Lovell) most of the time is spent on the flight directors and flight controllers, whom the audience will not have seen before (with the exception of Gene Kranz of course). The men are frank and emotional. We really get a sense of what it was like to figure out how to fly to the moon with no instruction manual. Most of the stories told in Mission Control are stories you’ve heard before: the Apollo 1 fire, the Apollo 11 program alarms, and Apollo 13. So you might ask, why do I need to hear these stories told again? Viewers should temper their concerns that they might be bored by the retelling. Instead, you will feel in some cases like you are hearing the stories for the first time. Hearing it from the point of view of the consoles in mission control lends a new perspective and drama that is missing from a History Channel documentary. Not to mention, the filmmakers of Mission Control were able to find a lot of very interesting archival footage that I had never seen before. The video of a technician inspecting the burned out Apollo 1 capsule while taking notes was especially unexpected and haunting. Mission Control will certainly be enjoyed by general space fans, but it will be loved by anyone who has worked in mission control, from 1961 to today. The filmmakers do a great job of tying the history to the present day, with two brief bonus interviews near the beginning of the film with current flight directors Courtenay McMillan and Ginger Kerrick. McMillan and Kerrick discuss the strong influence of the founders of mission control on the current generation in both emotional and humorous terms (McMillan tells of referring to the movie Apollo 13 and “the guy with the buzz cut and the vest” when explaining her job to friends and family). There was a lot for me to relate to in the film, from descriptions of simulation training to the look of simultaneous fear and satisfaction on Steve Bales face when singled out for recognition by legendary flight director Chris Kraft. NASA’s Apollo program of the 1960s was an odd moment in time. You have to wonder if those who made the moon landings happen realized the impact they had at the time; did they even realize what was going on in the outside world? Bob Carlton in the movie talks of being so busy that he neglected his family. If he had to do it all over again, he said he wouldn’t. You have to imagine they were so heads down that the social and political turmoil outside may have gone unnoticed. Gene Kranz confirms that they often got consumed with their work while planning for a mission. He says that after moving on to management work during the later Apollo missions, he found himself more appreciative of Apollo’s impact. Ed Fendell relates a story of walking into a diner the morning after the Apollo 11 landing and hearing a man say the only time he had been prouder to be an American was when he landed at Normandy in 1943. However, we also get a sense that the men of mission control were indeed a bit insulated from anything not NASA related. Jim Lovell himself, when talking about his Apollo 8 mission in December 1968 – the first to the moon – refers to The Christmas Eve broadcast from lunar orbit. This is a familiar story. Apollo 8 was a ray of hope at the end of a very difficult year in America. But rather than point out how Apollo 8 felt uplifting to Americans, Lovell instead says “it all just fell into place,” as if sending three men to the moon – impressive as it was – could simply erase for nearly 17,000 men lost in Vietnam (the worst of any year), the violence at the DNC, and the assassinations of RFK and Dr. King*. This is the beauty of Mission Control. We get real insight into an era we all love, but from the nuanced and flawed perspectives of 17 men that made it happen. One historical theory of the Apollo Program is that it was a flash in the pan – a combination of leaders, money, fear, talent, and other motivations that can only come together once in a century. A key part of that recipe was Dr. Chris Kraft and his ability to take his vision of a mission control center and bring it to life by collecting an incredible team of engineers from all over the country. They were of varied backgrounds, temperaments, and leadership styles; some were abrasive; some were quiet. But all of them were committed to their task in a singular way. East coast, West coast, Midwest, southern drawl, and even son of Chinese immigrants, it didn’t matter. They were the embodiment of teamwork, giving us a lot to learn from their history. I had a few nitpicks of the film, mostly to do with some editing choices and the omission of some of my favorite stories. The biggest mistake is that it took someone so long to make Mission Control. While the average age in mission control during Apollo 11 was younger than 30 years old, the men of that era are now approaching an average age of 80, and many important men (Jack Garman, John Llewellyn, and others) have died. Without their voices, we would be missing an important part of the tale of the origins of NASA. I am thankful to author Rick Houston for doing the extensive research that led to the book Go, Flight! and to the filmmakers for making a documentary that has so much meaning to me. Hopefully Mission Control will be successful enough to encourage someone to pursue a similar project for other eras in mission control. There are still many stories to hear from Shuttle, Skylab, Mir, and ISS. Help encourage this kind of filmmaking is appreciated by ordering Mission Control on streaming or buying the DVD (go to missioncontrol.movie). I guarantee you will learn something new! *See Jeffrey Kluger’s new book Apollo 8 for more on 1968 and NASA’s impact. NASA has finalized an agreement with Boeing to use the extra seats on two Soyuz flights to the ISS over the next year and a half for additional US astronauts. There is some contractual stuff going on here, but basically NASA is going to use seats that Roscosmos was going to leave empty to save money. Virgin Galactic has spun off its LauncherOne program into a new company called Virgin Orbit. Jeff Bezos’ company Blue Origin is now getting in on the new moon missions also. According to the Washington Post (owned by Bezos), Blue Origin has floated a proposal to the new US presidential administration that they want to help support NASA missions to the moon with their Blue Moon concept. United Launch Alliance launched an Atlas V rocket from Vandenberg California, carrying two satellites for the NRO. China launched one satellite on their new Kaituozhe-2 rocket. It’s hard to keep up with the current ISS crew, the members of Expedition 50, as they tweet like its all they do in what little spare time they have. Here’s a selection of the best pictures from just the last week. NASA’s MAVEN probe in orbit of Mars executed an avoidance maneuver of about 0.4 m/s to avoid colliding with the moon Phobos. That velocity change is small, about on the order of the debris avoidance maneuvers we do with the ISS. Check out these dust devils spotted by Curiosity rover on Mars. Did you know that Saturn’s moon Enceladus is half cratered and half smooth? Check out this recent image from NASA’s Cassini probe to see for yourself. During a media conference call on Friday, NASA managers provided some details about the potential plan to put astronauts onto the first test flight of the new SLS rockets. In particular, they stated that they would look at putting a crew of 2 onto the EM-1 mission for a 9-day loop around the moon (the baseline EM-1 mission is a 31-day mission, including a period in lunary orbit). The study should be completed in the Spring. And then, on Monday, SpaceX held its own media conference call to announce plans to send a Dragon 2 capsule on a very similar trajectory to the revised crewed EM-1 mission. The plan would send two paying civilian astronauts on a trip around the moon next year. Welcome to the new space race? Virgin Galactic had another glide flight of its new SpaceShipTwo spaceplane last Friday. The popular movie Hidden Figures, which tells the story of three women mathematicians and engineers who worked at NASA in the 1950s and 1960s, had three nominations for the Academy Awards on Sunday, but did not win any. During the award show, Katherine Johnson, one of the women on which the movie is based, was invited on stage. Speaking of movies, check out this new theatrical trailer for Mission Control, a movie based on the book Go, Flight! by Rick Houston. And here’s one more fun video before we move on to actual news that happened in space. Check out this segment Stephen Colbert did on his visit to Boeing’s facilities at Kennedy Space Center. There was only one orbital launch since my last post: On Thursday, February 23 Roscosmos launched a Soyuz rocket carrying a Progress cargo spacecraft headed to the International Space Station. That Progress spacecraft arrived at the ISS a day later without issue, less than a day after the SpaceX Dragon capsule – launched on Sunday, February 19th – was captured using the Space Station’s Canadarm 2. Here’s a timelapse of what it looks like to conduct that operation from inside the Cupola module. While the Dragon rendezvous on Thursday was flawless, it came a day after a previous attempt had to be aborted due to an issue with relative GPS navigation with the space station. NASA announced on Wednesday that the Spitzer Space Telescope had confirmed the existence of 7 small rocky worlds (similar in size to Earth) around the star TRAPPIST-1, which is 40 light years away. Two space shuttle astronauts, Brian Duffy and Scott Parazynski, were recently inducted into the astronaut hall of fame. Apollo astronaut and moonwalker, Edgar Mitchell, died at the age of 85. Former President George H.W. Bush (Bush 41) visited Johnson Space Center and talked to the ISS astronauts from the Mission Control Center. All of the segments of the primary mirror to the James Webb Space Telescope (JWST) have been assembled! The Laser Interferometer Gravity-Wave Observatory (LIGO) has detected “gravitational waves”, which is what it was designed to do. This is a basically a new way to see the universe – like the first time an X-Ray observatory was put into space and returned data. Not only that, it validates parts of Einstein’s theories. Here are some brief articles from Phil Plait and Sean Carroll, who explain it well. Check out this amazing zero-gravity music video by Ok Go, which doesn’t use any digital effects. Wow! Curators at the Smithsonian recently did a 3D scan of the inside of the Apollo 11 Command Module, Columbia, and found previously unknown handwritten notes on the walls. Astronaut Kevin Ford has retired from NASA. The new SpaceX “transporter erector” at pad 39A in Florida is pretty cool looking. A number of rocket launches since my last post in late January: a Chinese rocket launched one of their navigation satellites (Beidou), a ULA Atlas V launched a GPS satellite, a Russian Soyuz rocket launched one of their navigation satellites (GLONASS), a ULA Delta IV launched a secret USA reconnaissance office payload, and lastly North Korea launched something. This brings the worldwide launch cadence for the year up to 10 so far, or almost 2 per week. We are still waiting for the first SpaceX Falcon 9 launch of the year, which should be before March. Veteran cosmonauts Sergey Volkov and Yuri Malenchenko conducted a successful spacewalk on the Russian Segment of the ISS. The European Space Agency has announced that they are no longer attempting to send commands to the lost Philae lander, which has not transmitted from the surface of comet 67P/Churyumov–Gerasimenko in months. China has released some new photos of the moon from it’s Yutu rover mission (the rover died some time ago). The European Space Agency published a thought-provoking video about the future of lunar exploration. Here is some interesting PR from the aspiring asteroid mining company Planetary Resources. At the Consumer Electronics Show they revealed a prototype that they 3D printed from a meteorite. SpaceX’s next Falcon 9 launch will be from Vandenberg in California on January 17th. The rocket will be carrying the NOAA’s Jason-3 satellite. In addition, SpaceX will attempt to recover the first stage on their autonomous drone ship. The United States Postal Service will issue new stamps with images of the New Horizons spacecraft and Pluto. Speaking of New Horizons, that NASA team has won the annual Goddard Memorial Trophy. NASA has officially organized a new Planetary Defense Coordination Office for overall management of projects for detection and characterization of Near Earth Objects (NEOs). Next Friday “the Tims” (astronauts Tim Peake and Tim Kopra) will get to do a spacewalk. On Mars, the Curiosity rover has driven right up to a 13 foot tall sand dune and is sending us some pretty cool pictures. Also on Mars, the long-lived Opportunity rover is celebrating 12 Earth-years on the surface.